Surgery to place the shunt went very well! The same neurosurgery team that did Colten’s spinal surgery did the shunt placement (Dr. Maher and Dr. Stetler). The anchor or insertion point (I’m sure this is not what it’s called but for lack of the right words, I’m using those) is towards the front right area of his head. I assume Max will use this area as a future target during throwing practice. The tubing can be seen running down the side of his skull, behind his ear, down his chest and into the abdomen. We can’t see much of the incisions as they are obviously covered with bandages, but we can certainly see the shunt and tubing. 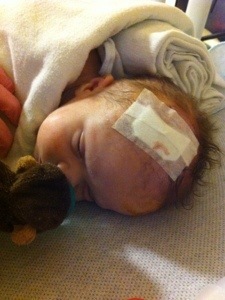 Eventually his hair will mostly cover the top part of the shunt and the tubing will be barely visible beneath his skin. Kind of hard to even see it in the pictures actually! When we were waiting during Colten’s surgery, we started talking about how he would be getting his first haircut back there as they would need to shave part of his head prior to surgery. We lamented about not having his first haircut hair saved like our other boys’ first haircuts. But he certainly has enough other mementos from the first two weeks of life – scars, a plethora of hospital bands and IDs, etc… So it is what it is. When we went back after surgery to see him, there on his bed was a canister with his saved hair! I love Mott Children’s Hospital! We did find out two promising pieces of information today regarding future surgeries. We ran into one of the urologists in the pre-op area and were asking him about the surgery needed to fix Colten’s urinary reflux into his kidneys. His reflux is a Grade 2 diagnosis and the urologist said that about 80% of those kids grow out of the issue, so Colten might NOT need that surgery. YAY! Then in talking with Dr. Maher post-op, we found out that while all myelo kids will develop a tethered cord, only 1 in 3 will actually by symptomatic and require surgery (most often during the growth spurt ages of 8-18), so it is NOT something Colten will go through “for sure” – he has a 66% chance of NOT needing the surgery. Another YAY! In regards to the shunt specifics, we are told we really don’t have to take a lot of precaution with it. Dr. Maher reassured us that there is more chance of a blockage causing an issue than an impact. Kids with shunts play football and get knocked in the head all the time and the shunt still functions just fine. They rarely see shunt impact issues. That was reassuring considering the wrestling habits of Colten’s older brothers! And in regards to infection (that would lead to brain damage), it’s something to watch for in the first three months closely, then through the first year, but after that if a shunt has not caused an infection it is highly unlikely that it will after that point. That was a bit of a relief as well. Colten is now on the general pediatric floor (12) and the docs hope to release us at some point tomorrow, Thursday, so long as all goes well throughout the night and he comes out of this sleepiness stage by then. 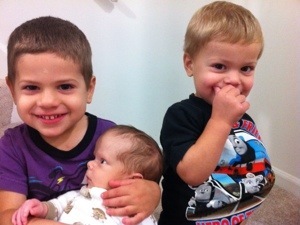 I’m here overnight with Colten, and Richard returned home to be with Parker and Max. This entry was tagged hydrocephalus, Mott Children's Hospital, shunt, Surgery. Bookmark the permalink. Drilling into the brain, right through the skull. That reminds me a lot of my first couple years teaching high school. Except I was the drillee and the students were operating the drills, and I will add, very masterfully! I still bear the scars. Anyway, your message has lots of notes of hope, joy, and positive energy. We’ll keep praying that this is the music that will continue in these next few days, weeks, months, throughthe conclusion of his first year it has morphed into a symphony of wonderful transformation. Those pics of the boys are precious beyond words! Good! Sounds like a good day considering all the worry and questions that arise. 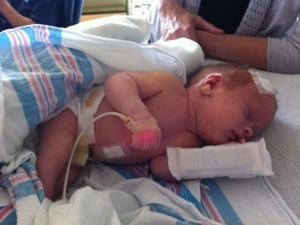 He is doing good and Will go home soon! He has to be home for his first Halloween Day!!! God Bless and go Colton and Tigers!!! SUCH GREAT NEWS!! I wanted to check to see if your blog was up before I went to bed! I am glad I did! I can’t wait to see you soon and meet Colten! Lastly, my friend who’s daughter has a shunt put in said she was a whole new baby afterwards! I know Colten will be too! MUCH LOVE being sent your way!! You call Parker/Max/Colten the Three Musketeers. I’ve thought of them as The Three Amigos!! I think they’ll be 3 best buds. I already know that Parker is such a nurturer, tender, sensitive and loving soul. Maxson is a smiling, tender, huggy/feely and loving soul. 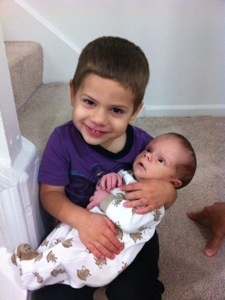 They will be the best big brothers Colten could ever ask for.